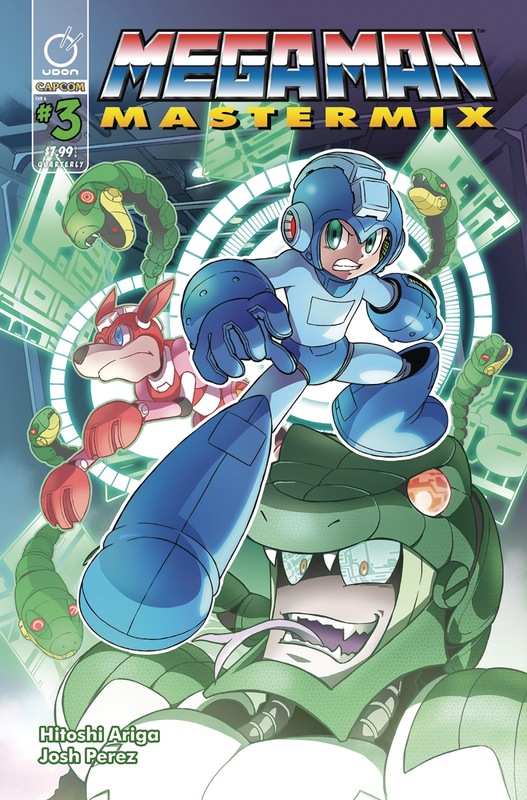 The second issue of Mega Man Mastermix isn't due out for another few days (Wednesday, April 25th) and already we have a sneak peek at issue #3's fantastic covers. There's only two covers this time round UPDATE: three covers! The standard cover by Hitoshi Ariga a variant by Genzoman, and another variant by Josh Perez (the design is inspired by Rock & Rule). 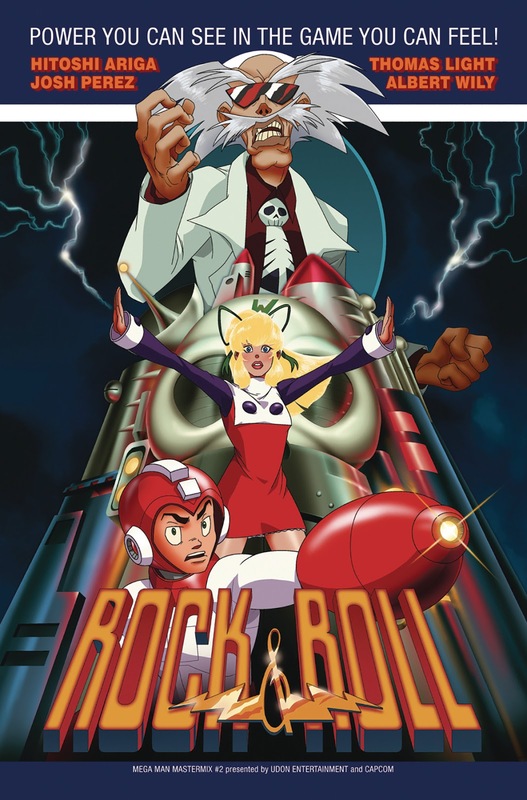 Rock, Doctor Light and a reformed Doctor Wily travel into space to investigate an asteroid of alien origin! Along the journey, they find themselves attacked by not only eight new Robot Masters, but the mysterious Break Man as well! It's an adventure of all-out automaton action in outer space!" 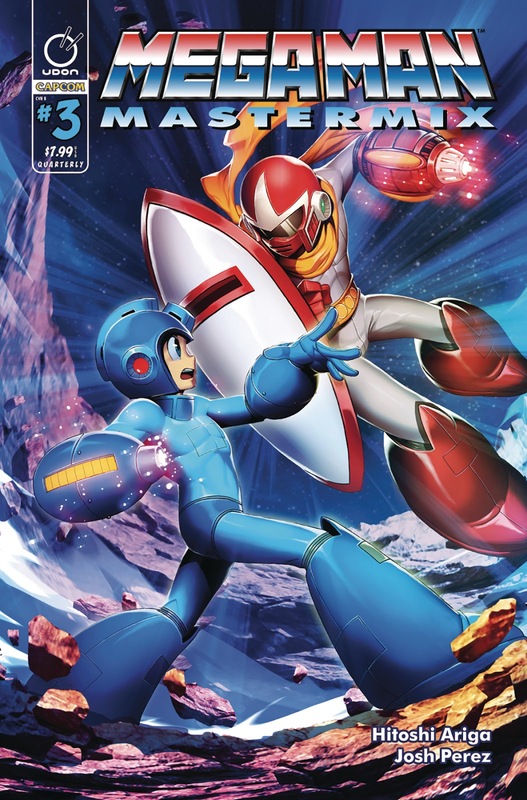 Mega Man Mastermix #3 hits newsstands on July 25th, 2018.
ah, so this was Geenzoman. seeing the cover i thought the artstyle seemed familiar. So, they make a mix between Megamix and Gigamix? Ok, that's cool! Forgive me for saying the obvious, but perhaps that's why it's called a "MasterMix". "...the design is inspired by Rock & Rule." copy just with Wiley, Megaman and Roll. How can you praise this?! I call it lazy. It's an homage/tribute. I was going to use my personal style for the cover, but I really wanted to nail the style Rock and Rule had(I'm a big fan of Rock&Rule). I could have used the Ruby Spears style for a double-homage, but I only realized that in hindsight. It was about 5-6 hours of work with no tracing involved; I wanted to make sure people that new Rock&Rule would recognize the homage right away. It's not going to be for everyone, and it's fine if you want to think it's lazy- to each his/her own. Those that will enjoy it will like this and those that won't won't get buy this cover; I'm fine with that. Thank you for your hard work Mr. Perez I pre ordered this because myself and my mother is a fan of the Rock and Rule movie pay no attention to the fool who want to say negative things about it clearly he has never seen this movie in his entire life plus if he think he can do any better, then why doesn't he show us his artwork put up or shut up that's what I would have said to him. "another variant by Josh Perez (the design is inspired by Rock & Rule)." What an obscure reference. Like, really obscure. In fact, if I hadn't tripped over the movie, completely at-random, I probably wouldn't have gotten it. Hah. Anyway, odd-looking cover, but pretty neat. All the covers are pretty good, though. Wait, how do we know someone is "weebing up"? What if they just happen to like Ariga's cover? Aside from that, I was so used to Asteroid Blues being a separate issue I never thought about them publishing in chronological order. I hope it fits in well. That they like it for the sole reason "it was done by a Japanese guy". Biased toward the Japanese artist because it's a series that originated in Japan and therefore only a Japanese person should do the art and that anyone else doing it is desecrating the series. I mean that kind of weebing up. In all my 2 years of having discovered Rock and Rule and becoming a fan of it, I never would've anticipated Mega Man to acknowledge it's existence. My gosh.. some of covers are an American artists... SO HORRIBLE! Was that even supposed to be English?